The Aranguez T.I.A. School first started on the 1st November, 1951 under the Head Teacher, Mr. Jameel Gaya Rajkumar. The first teachers were Mr. Abrahim Asgarali, Mr. Yousuff Ali, Mr. Solomon Mohammed, Mr. Shaheed Mohammed, Mr. Omar Mohammed, Mrs. Abida Chokolingo, Mr. Mohammed Saied and Miss Cynthia Hoseiu. It had an enrollment of three hundred and sixty pupils. This school came into existence because the population of El Socorro and Aranguez was growing rapidly and many children were unable to find school places in the existing schools. Mr. Farouk Mustapha, an Executive member of the Tackveeyatul Islamic Association provided the material and assisted in the construction of the shed adjoining the El Socorro Mosque at the comer of El Socorro Road and Farouk Trace, San Juan. Mr. Farouk Mustapha himself was Manager for many years. In November, 1958 Mr. Raphic Ali succeeded Mr. J.G. Rajkumar as the Principal. By this time the school was settling down and in the years to follow moved from strength to strength. Though the building was of a rough nature, with the roof barely seven to eight feet high at some places and with no celotex [ceiling], the teachers toiled with might and main to impart to the pupils the education which was so vitally important and necessary. The building deteriorated after some years and much had to be done to replace it. In 1964 through the instrumentality of the Honourable Kamaluddin Mohammed, a trustee of the T.I.A. and Minister of Government, approval was obtained for the construction of a new school at Boundary Road, Aranguez. The great day for the teachers and pupils came on Monday 26th April, 1965 when they moved over to that new structure after fourteen years in a crude building. Imam Razack Ali was appointed Manager of the new school. Mr. Sardik Ali who took up an appointment as a Teacher I in January 1959 was promoted to Vice Principal I on the 1st September, 1970. This school has made rapid progress over the years as the attendance rose from three hundred and sixty in 1951 to six hundred and seventy-three in 1974. 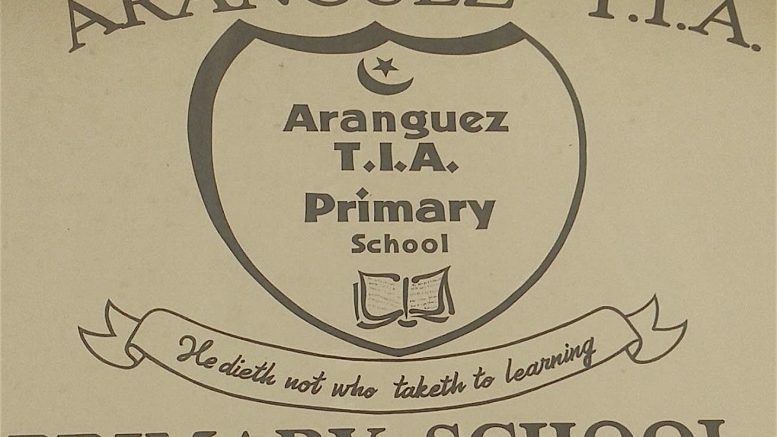 Among the many teachers who passed through this institution were Mr. Omar Mohammed, Mr. Shaffick Subratee, Mr. Majeed Ali, Mr. Zainool Sarkar, Mr. Nurul Sarkar, Mr. Mustaq Ali, Mr. Kazim Hosein and Mr. Nizamudeen Ali. These and many others have left their mark in the history of the school. During the period 1966 to 1973 the school won two hundred and thirty-one (231) Scholarships for Secondary Schools. In 1966 twelve students won Scholarships and in 1973 ninety students won scholarships through the Common Entrance Examination to Public Secondary Schools. At the Post Primary School Leaving Certificate Examination during the same period 1966 to 1973 thirty-three students were successful in passing this Examination. Since Aranguez is famous for its agricultural products, the school garden is an important facet in the life of the school. For the past seven years the school placed three times in the First Division Prize Group and four times in the Second Division Prize Group. A historical fact which cannot be omitted is extra-curricular activities in the form of sports. Cricket, football, and netball are the most important games played and annually the school participates in the Inter Territorial Sports of the country. The School also holds its Sports meeting bi-annually and in 1971, there was a “gala-extravaganza” in Sports when Mr. Shamshuddin Mohammed, M.P. of the area opened the games. At present there is an enrollment of six hundred and seventy-three pupils. Extracted from Tackveeyatul Islamic Association of Trinidad and Tobago Inc – Silver Anniversary souvenir brochure published in 1974. Be the first to comment on "ARANGUEZ T.I.A. 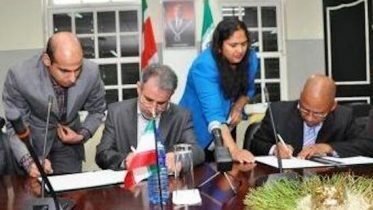 School (1951)"
Visiting Iranian Deputy Minister, Amir Mansour Borgehei and his Surinamese counterpart, Winston Lackin signed a memorandum of understanding between the two countries yesterday in Paramaribo…. Caribbean Muslims of Indian ancestry must embrace and celebrate their heritage.